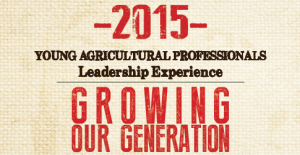 Young agricultural professionals from across Ohio are invited to attend the annual Leadership Experience “Growing Our Generation” Jan. 30 and 31 at the Renaissance Columbus hotel. The conference features plenty of fun, educational sessions featuring entertainment by the Peterson Farm Brothers and keynote speaker Mike Pearson, host of Market to Market. Cost is $150/individual and $200/couple. RSVP by Dec. 19. Check out participants from last year’s conference and see why they’re involved with Farm Bureau’s Young Agricultural Professionals program. Like the Young Ag Professionals Facebook Page and subscribe to the YAP eletter for the latest activities and announcements.